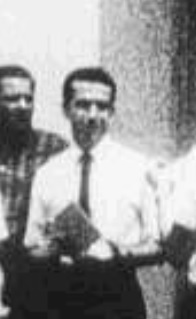 Photo of Rafael Cruz, Sr. attached to a 1954 Cuban Ministry of Education secondary education graduation certificate from Matanzas. Man to Oswald’s left, in center with tie, is reportedly Rafael Cruz, the father of the man who wants to be the next president of the United States. 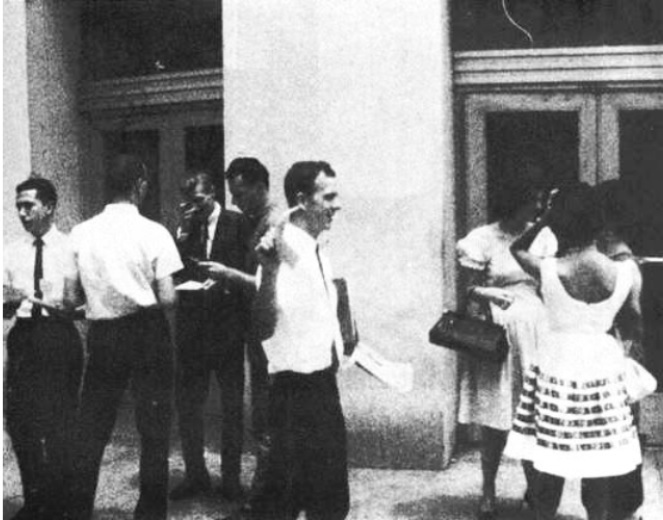 Photograph taken on August 16, 1963 outside the International Trade Mart in New Orleans. Oswald used the alias A J Hidell. It’s possible Cruz may have also used one. Another view of the purported Cruz [far left]. Blown-up photo of Rafael Cruz with Fair Play for Cuba in New Orleans in 1963. 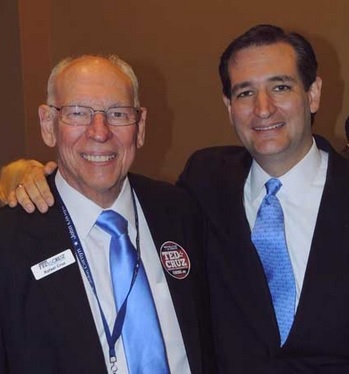 Rafael Cruz today with his son at a FreedomWorks event in Salt Lake City in 2013 where Rafael Cruz falsely stated he fled Castro-led Communist Cuba. What else has the elder Cruz lied about? 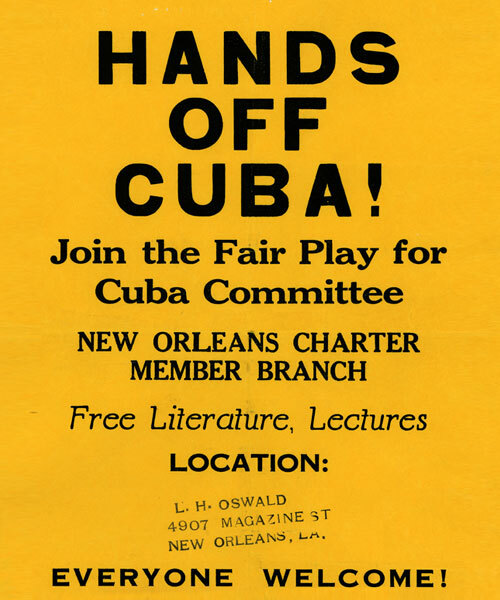 Someone should print this original pamphlet in color and hand it to Rafael Cruz, Sr. and ask him if he handed them out in New Orleans on August 16, 1963. Oswald was arrested along with three Cubans on August 9, 1963, not necessarily the same Cubans he was later photographed with at the trade mart, after he got into what is considered to have been a “staged” fight with anti-Castro Cuban activist and lawyer Carlos Bringuier. Before Oswald’s very public fight with Bringuier and Oswald’s subsequent arrest, the ex-Marine offered to help the DRE train its commandos to fight against the Castro government in Cuba. On August 9, 1963, Oswald was found guilty of disturbing the peace and he was fined 10 dollars. It is known that Oswald worked with Bringuier and Clay Shaw in anti-Castro activities linked to the CIA. Bringuier’s Student Revolutionary Directorate (DRE), an anti-Castro organization, used the same 544 Camp Street address as Oswald’s Fair Play for Cuba Committee. Moreover, Bringuier had in his possession Oswald’s personal copy of the book, Guidebook for Marines. In 1957, Rafael Cruz, a former salesman for the U.S. intelligence-linked RCA Corporation, left Cuba for the United States. Cruz claims he fought with Castro against the fascist government of Fulgencio Batista but soured on the revolution. However, Cruz left Cuba two years before the Castro revolution. Cruz arrived in Austin where he enrolled in the University of Texas. This is a strange story since he claimed he left Cuba with only $100, which he said was sewn into his underwear. Cruz eventually gained U.S. permanent residency and a degree in mathematics from the University of Texas. In 1959, Cruz married Julia Ann Garza and, after Cruz graduated from the University of Texas in 1961, the couple moved to New Orleans from Dallas after the birth of their second daughter on November 18, 1962. Cruz was in New Orleans during 1963, the year that New Orleans District Attorney Jim Garrison claimed his city was the focal point for the plot to assassinate President John F. Kennedy. The plot involved a number of Cuban exiles. Accused assassin Lee Harvey Oswald claimed, as part of his “fake defector” persona developed by the Central Intelligence Agency, to be a member of the pro-Castro Fair Play for Cuba Committee. The committee just happened to share an office address with Guy Banister’s private investigation agency. Guy Banister Associates was located on the ground floor of the Newman Building at 5312 Lafayette Street while Oswald’s “pro-Castro” Fair Play for Cuba Committee was located around the corner but on the ground floor of the same building but with an address of 544 Camp Street. Banister was a retired FBI agent who continued to carry out tasks for the bureau and the CIA. The Newman Building housed a number of anti-Castro groups, including the Cuban Revolutionary Council, Crusade to Free Cuba Committee, the Cuban Democratic Revolutionary Front, Anti-Communist League of the Caribbean, and Friends of Democratic Cuba. While living in New Orleans, Cruz was also active with anti-Castro movements and the chances that he did not cross paths with Banister and the other anti-Castro activists, including CIA agent Sergio Arcacha Smith, are highly unlikely for such a close-knit community at the time. While living in New Orleans with his wife and two young daughters, Cruz claimed residency at two addresses, one a low-rent apartment building off of Jackson Avenue. Cruz worked for an oil company in New Orleans. He has been less than forthcoming about the details of his time in New Orleans and the time line that included his move from Dallas. Cruz and his wife Julia divorced in New Orleans or Dallas, allegedly in 1962 or 1963, but this detail is also clouded in mystery. Cruz apparently registered for the draft in 1967 claiming the New Orleans’ Jackson Street address. Draft registration was a requirement for resident aliens like Cruz. Cruz apparently waited until the age of 28 to register for the draft, which, because he waited so long, was a criminal offense at the time. While liable for the draft and possible service in Vietnam, a country where fellow Cuban immigrant Otto Macias gladly volunteered to serve, Cruz took off for Calgary, Canada with his second wife, Eleanor Darragh. Darragh, a native of Delaware who graduated from Rice University in Houston, worked for the same oil company in New Orleans that employed Cruz. Their son, Rafael “Ted” Cruz, Jr., now a candidate for president of the United States, claims that his mother and father worked for the same company in New Orleans but there is actually no record of an Eleanor Darragh Wilson Cruz living in New Orleans at the time. Eleanor Wilson, married to Fort Worth, Texas native Alan Wilson, lived in London from 1960 to 1966. In 1965, their infant son Michael died from crib death. Alan Wilson, who still lives in London, told McClatchy News Service that Michael was not his son. In his autobiography, Senator Ted Cruz not only claims Michael was the son of his mother and Alan but also claims the baby died in 1965. In fact, Michael, according to London vital statistics records, died in 1966 and well after the Wilsons were divorced. Eleanor Cruz, who lives in Houston, has been mum on her marriage to Wilson and her marriage to Cruz, which lasted from 1969 to 1997. Ted Cruz was born in Calgary in 1970 and there is a major question about his eligibility to serve as president since Cruz maintained Canadian citizenship until 2013.